Top 10 Belize Cruise Tours: 5 Best Land Based and 5 Best Water Based! Belize is rapidly becoming a popular stop on itineraries for Western Caribbean cruises. Not only is the area incredibly rich in historical legacy, but its landscape is filled with beautiful rivers, dense forests and an incredible array of wildlife. The area, which lies centered between the Caribbean, Guatemala and Mexico, is well known for its conservation efforts, and as a result over one fifth of all of the land here is devoted to natural reserves. But, aside from the wealth of activities and sights to see that are found on the mainland and dotted cays off the coast, the waters surrounding Belize are well known for being home to some of the best scuba diving in the world. This combination of stunning environments means that there are numerous Belize cruise tours available to guests, including those that take place on terra firma, and those that do not. And, whether you’re on the hunt for adventure, or a relaxing sightseeing tour, there are surely numerous Belize cruise tours that are perfect for you. We have put together a list of the 10 best, half by land and half by water, to help you decide whether you want to get your feet wet or stick to the soil on Belize tours. 1. Mayan Ruins: One of the biggest allures to guests traveling to this part of the world is an opportunity to go back in time and explore the ruins of a once great civilization. Mayan ruins can be found in many parts of Central America, each with its own unique blend of buildings, pyramids, carvings and sculptures. 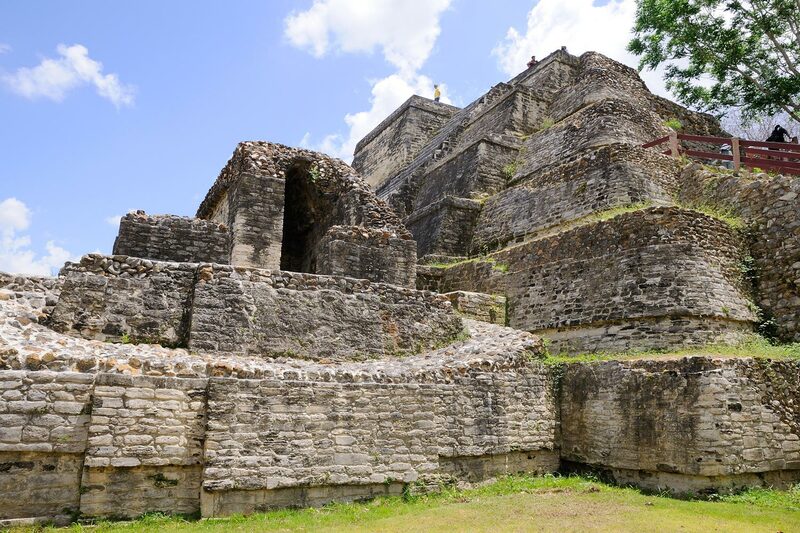 Most Belize cruise tours here take guests to the site of Altun Ha, which has been well excavated and affords guests a look at what was once a hub of Mayan trading and ceremony. Another memorable site is Xunantunich, but it takes quite a journey for cruise ship guests as it is located near the border of Guatemala and only reachable via hand cranked ferry. It’s worth the trip however, as it boasts the ruins of more than twenty five buildings. 2. Cave Excursions: Caves were incredibly important to the Mayan people who regarded them as sacred places connected to the underworld. In many caves in Belize, religious and ceremonial rituals were performed long ago, meaning that guests can walk along in the footsteps of the devoted peoples. Although technically considered a dry land activity, there are wetter versions of cave explorations available on Belize cruise tours, and guests can elect to ride through, rather than walk through them. 3. Cultural and Historical Center: Although the Mayans may be the most well known historical residents of Belize, there is a lot more history to be found here than just the ancient civilization. The Cultural and Historical Center starts with the familiar Mayans, but brings guests all the way up to local history into the 1900s as well, making it a well rounded and informative look at the history of the area and the contributing factors to the local culture. There are many artifacts for guests to see and appreciate, and the tour is short enough to allow for a little exploration time perhaps in the Tourism village, where the tour begins and ends. 4. Government House: For those that want to skip past the Mayans and experience life in Belize during the colonial era, then a trip to the Government House is a perfect pick. Here several rooms of locally produced artwork are on display, along with artifacts from Colonial times like dishes and decor. Many documents are on display as well for guests to peruse and enjoy, such as a letter from the wife of a former Governor, responding to local refugees following a hurricane. Historical tours are popular at many destinations along the routes of Western Caribbean cruises because from ancient civilizations to pirates to colonial settlers, the area is very rich in history. This particular tour of an old Government house is brief, lasting an hour or less, and is perfect for guests looking for shorter Belize cruise tours. 5. Modern and Colonial Belize City Tour: Despite what the name of the tour might suggest, the Modern and Colonial Belize City tour provides a much more in depth look at the area than just a mere pointing out of changes in architecture. Guests are treated to some of the redeveloped parts of the area where modern parks and banks provide an updated feel, but also to old cathedrals and government buildings. Knowledgeable guides also treat guests to a brief lesson in the culture, economic condition, cuisine and crime rates of the area, and visitors are often intrigued to learn about the area’s infrastructure and societal challenges. Highlights from the tour include the Belize Swing Bridge and a town with only speed bumps in place of traffic lights. 1. Shark Encounter: Diving is common in many parts of the Caribbean because the area is utterly ideal for the activity. However, in some places, it gets more exciting than in others. The Shark Encounter Tour offered in Belize, takes guests to an area where rays and nurse sharks congregate en masse, ready to be viewed and touched by brave adventurers. Unlike most eco-tours where looking is the height of the action, touching here is permitted, and encouraged (so long as you do not have an aversion to teeth an stings). 2. Cay Snorkeling: Because the second largest natural reef in the world can be found not far off the coast of Belize, it is home to some very, very appealing snorkeling sites. Many of these are located near the Cayes, or small islands, that lie a few miles off Belize’s coast. Some of the most popular viewable creatures on snorkeling trips here are starfish and seahorses, but the area is literally overflowing with sea life. Snorkeling remains one of the most popular Belize cruise tours booked by ship passengers and is ideal for those that are not comfortable or certified in scuba. 3. Scuba Diving: Although there are a great many excellent places to scuba dive off the coast of Belize, arguably one of the very best is the three square mile site included in the Hol Chan Marine Reserve. Here, a the reef acts as a revolving door, letting animals from the open ocean in and out as they please, meaning that life diversity is far greater here than other points along the reef. Guests can see barracudas, sea turtles, sharks, rays, many fish and more when on Belize cruise tours to Hol Chan, located over ten miles from the coastline. 4. River Tubing: There are jungle tours, and then there are jungle tours with pizazz. Why walk through the jungle, when you can ride right on through it and pass directly through some of the most significant and historic caves in all of Central America. Visitors have a seat in an inflated tube and set sail for a lazy ride down the river that takes them in and out of cave after cave that in the past played host to an array of Mayan activities. Knowledgeable tour guides make this both a relaxing and educational experience. 5. River Boat Rides: Traveling up and down a river may not sound like a thrilling activity for guests getting off their big ships aboard cruise to Belize and then right back on to another, smaller boat. But, river boat rides are excellent choices in Belize cruise tours for guests who want to get a sneak peek at some of the area’s largest and wettest residents, crocodiles and manatees.